This JAXB2 Helloworld example post explains the basics of JAXB along with core concepts like Mapping, Marshalling & Unmarshalling XML to Java objects and vice versa, commonly used JAXB annotations, JAXBContext setup and API usage, XmlAdapter usage etc. Mapping refers to binding Java objects to XML structures and vice versa. With JAXB, we specify this mapping using set of JAXB annotations on java classes and properties/methods. Below is an example of how a POJO is mapped to XML using set of JAXB annotations. @XmlRootElement can be used to map a java class to the root of XML document produced by that class. Once applied on a class, all properties of that class maps to XML elements. You can however , use @XmlElement on individual property/methods to override default behavior( for example specify an Element with different name in XML than in java, specify required/optional/nillable attributes). For example Student.dob will be mapped to birthDate in XML. @XmlElementWrapper can be used to create a wrapper around a collection of elements. @XmlType can be used to specify the order in which the properties of a java object will appear in XML document. @XmlAttribute can be used to map a property to an XML attribute. Note that @XmlAttribute and @XmlElement can be applied on field level or on method level. In our case we are using them on methods. Marshalling refers to actually converting mapped Java objects to XML [generating XML from mapped java objects]. This step involves JAXB core API’s. 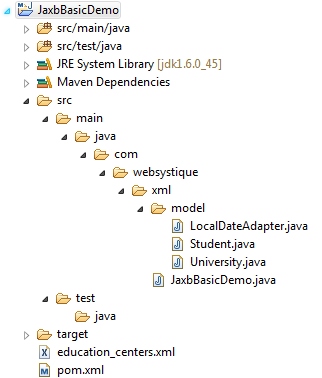 Next, create Marshaller to Generate XML from mapped and populated Java objects using JAXBContext created above. Output of this step is the generated XML shown in Step 1 [repeated here]. UnMarshalling refers to populating the Mapped Java objects from input XML using JAXBContext API. Next, create UnMarshaller to populate the Mapped objects with input XML using JAXBContext created above.We will use the same generated XML from above step for input in this step. Adapters are used to convert java data types into XML types and vice versa. You may have noticed that we are using Joda-time LocalDate class to specify dob property in Student class. But JAXB knows nothing about LocalDate. So we need to provide a way to help JAXB map this property into xml format. That’s where XmlAdapter comes into play. Using XmlAdapter you can convert Java Type into XML type. In our case we are converting LocalDate to String format. We can specify the adapter to be used using @XmlJavaTypeAdapter on respective property in java. Above class provides a way to convert a LocalDate type into String and viceversa. That’s all with basic usages. Below is the complete example for this post. Now let’s add the content mentioned in above structure explaining each in detail. There is no special dependencies to be declared. Since i am using Joda Time for any date time related processing (and also to show an important feature of JAXB), i’ll declare that here. You can skip it if you prefer to use Java Date api for the same. Create Sample Java classes [POJOs], and annotate them with appropriate JAXB annotations, in order to provide mapping between Java and plain XML. This post depicts an example of Student and University relation. Each student can have several properties. A University can have several properties and additionally multiple students. Student and University classes[both are pojo’s] and there properties, are annotated with JAXB annotations. These annotations tells JAXB which property of a Java object will be mapped to which element or attribute in XML. That’s it. In the next post , we will discuss about the schema validation using JAXB.